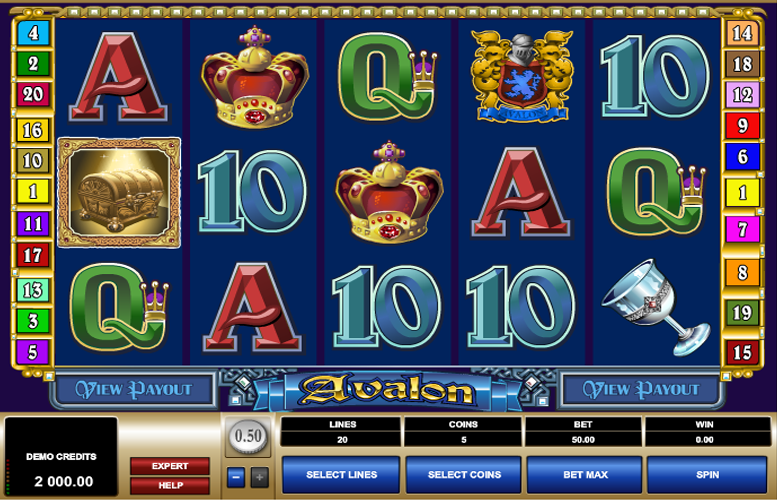 The Avalon slot from Microgaming takes us back to the time of King Arthur. An ethereal, yet melancholy backing music sets the scene for the legendary king’s final quest. According to the stories, Avalon was the final resting place of Arthur, hence the somewhat sombre mood. Whilst the theme is a great idea, the execution lets it down more than a little. There’s only one real feature (we don’t count “gambles” because players have got to risk their own winnings to play). Whilst the free spin mode does have the potential to hit a 7x multiplier, that doesn’t save this title from being a rather lacklustre outing. The presentation is solid but not exactly awe-inspiring. There’s very little to love here. Even fans of legendary kings and Arthurian legend will likely get bored fast. Nice theme. A more creative approach to tackling it would surely create an amazing game with lots of stylish artwork to represent the king’s passing to his final resting place. Fantastic music. It’s sombre and won’t be to everyone’s tastes but the ethereal organ music is the perfect accompaniment to a game with such a theme. Lacking in features. Avalon is all about the free spin mode. Even though it’s got a potential 7x multiplier, more features are always better. Low upper betting limit. High rollers will likely prefer to try a different title. Uninspired artwork. The subject matter surely deserves better than this generic offering. 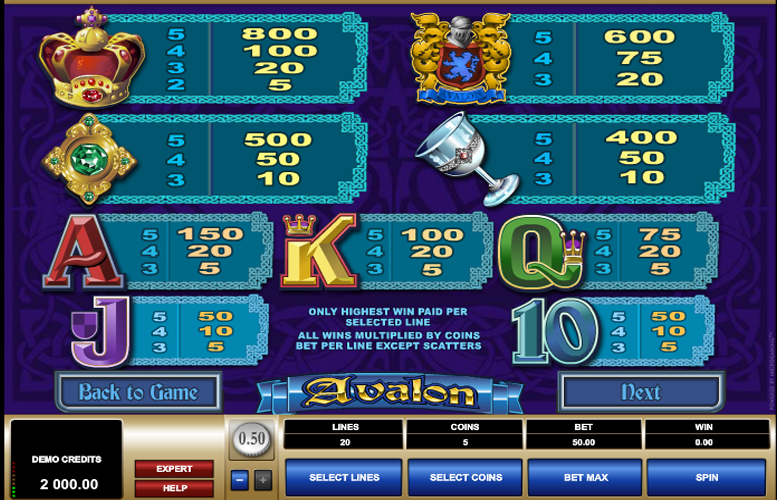 Avalon (wild) = 3,000x the line bet. Chest = 1,000x the line bet. Crown = 800x the line bet. Crest = 600x the line bet. Broach = 500x the line bet. Chalice = 400x the line bet. Landing three or more of the King Arthur “scatter” symbols in any position will trigger 12 free games with up to a 7x multiplier. The size of the multiplier will depend how many “scatters” landed on the reels to trigger the bonus. These free spins can also be retriggered. In addition, the chest and Avalon symbols will turn into “wilds” during free spins. Following any win players may select the “gamble” feature. If they elect to risk their winnings, they can choose between a double up and a quadruple up. To double their winnings, they must correctly guess the colour of a face down card. To quadruple them, they must correctly guess the suit of the card. Hitting “collect” will return them to the main game with whatever winnings they have managed to amass. Jack, or Ten = 50x the line bet. 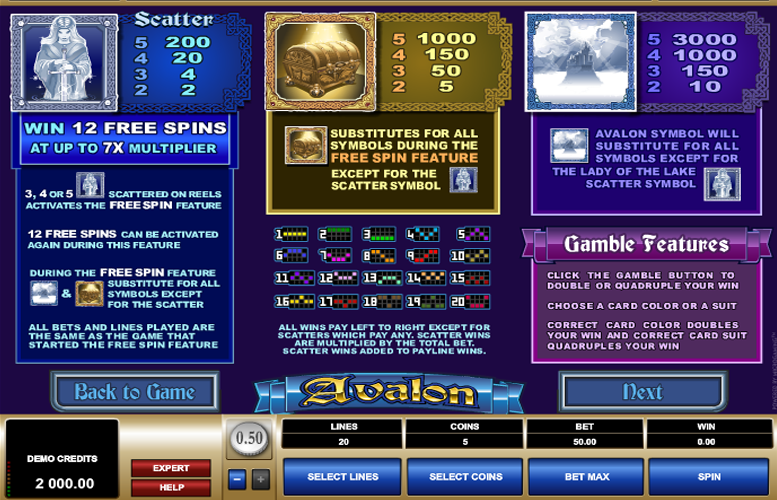 Players are given maximum control over how they spread their bets out on Avalon. They can adjust the number of win lines between one and 20, as well as the number of coins bet on each (one to ten). Finally, they can alter the value of each coin. The lowest here is just 1p and the highest a largely underwhelming 50p. This means that with all values set to their maximum, the lowest possible bet per spin is just 1p. Meanwhile, with everything maxed out, the price per play is a less than impressive £100. Granted, many will find this more than enough. However, some high rollers out there will think it overly restrictive. All things considered, Avalon is a rather weak offering. When you consider that it’s supposedly based on one of the most legendary heroes of all time, it’s hard to imagine why Microgaming didn’t task a more creative art department. We’re sure other developers could have done it greater justice. Avalon is also a bit of a let-down in the feature department too. There’s only one bonus and it’s a generic free spin mode. Sure, it does offer players the chance of a 7x multiplier but when the rest of the gameplay is so dull, is it even worth trying for? This game has a rating of 3 / 5 with 264 total reviews by the users.